Long before Marie Kondo had us questioning what sparks joy, I came to the conclusion I have too much stuff. I had read an article that said the average household has 300,000 items in it. You read that right. 300,000. And I thought, that’s nuts! Who could have so many things? And… why? And then I looked around and did the math. If you add up every article of clothing… every book and every spoon… every pillow case and paper clip and picture frame and puzzle piece and, well, just stuff… you’d easily get to that number or more. And then I thought… that’s just Way. Too. Much. Stuff. I’m wondering why I have all this stuff? Like I don’t even want all this stuff. Like I’m drowning in STUFF. And I became a little obsessed with reducing that number. And then it happens. You fill the space so it doesn’t seem so empty. And you keep accumulating and acquiring and adding and suddenly it’s stuffed with stuff and your neighbors upgrade into even more humongous houses and you think momentarily you might do the same. And then you feel it… shame. You don’t need more space for more stuff. You need less stuff and better use of your space. I didn’t think about joy at the time or which items spark it. I just felt like I had to rid myself of meaningless STUFF, to get out from under the weight of having so much but not knowing what to do with it. Consider that I have 17 mugs. You know how many of those 17 mugs I use? Just one. My favorite one. Every day. 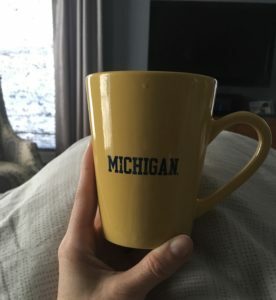 I swear coffee tastes better in it even when the Wolverines lose the bowl game. I have home decor for my beach house. I don’t have a beach house. But I might. Someday. I have clothing past its prime, toys no one plays with, products and art and tchotchkes that I don’t like half as much as I like saying “tchotchkes” and, yes, that’s how you spell it. So I decided to pare down. Much like health experts say overweight bodies would greatly benefit from a 10% weight reduction (I’m working on that too, that’s why I’m holding onto those currently-too-small pants) I decided I’d reduce the amount of STUFF I own by 10%. Ahem… Presuming we’re an “average” U.S. household of 300,000 items, that means I’m getting rid of 30,000. Yes friends, I am in the process of shedding 30,000 items, that estimated 10% reduction I intend to complete within the year. I started some time ago and am only now sharing this STUFF reduction journey because it seemed an inconsequential part of my story. But when I think about the Next Chapter I encourage everyone to consider, I realized that Editing Out what’s not working for me is the key to creating space for what does. But I don’t like the idea of just tossing stuff in the trash to go to the landfill. I want to properly dispose of items, put things that others might value into their hands and recycle whenever possible. Also, maybe get a little cash back for the cash I spent on this stuff. This process is more laborious than just renting a dumpster and tossing 30,000 items inside. But it is a labor of love. And I like a challenge. Can I do it? So I held a”$1 or Less” tag sale with “Freebie Finds!” to ensure unsold items would not make it back into my house. 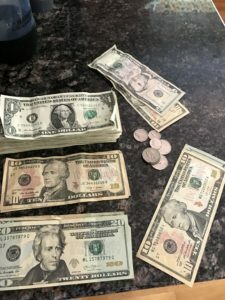 400 items gone and $130 added to my wallet. The blazer my son wore once before outgrowing it was sold at the kids’ consignment shop along with a few other designer duds. Towels and blankets in less than pristine condition went to line animal cages at the local Humane Society. Dried paint in half-full paint cans from colors used in rooms since painted over were recycled at a local paint store. Expired prescription medication from a surgery I had years ago was deposited at the locked dropbox at the police station a town over. You shouldn’t be taking that anyway, especially when it has an expiration date of 2011. 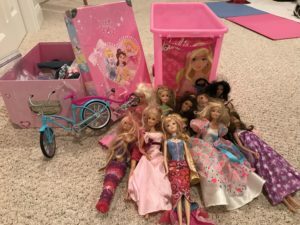 My daughter’s long-neglected Barbie collection went to a little girl who would give the dolls attention and hopefully a good hair-brushing. That’s not just the 15 Barbie dolls in that stash… it’s every outfit, tiny shoe and teeny handbag I had been storing in that giant Barbie-themed bin. Yes, those count as individual items (I’m counting them! ), more than 300 out the door. I’ve been working on this for months now and would say that adding the papers I shred by the dozens, I’ve made a dent of about 5-6 thousand items. Enough that I can see a bit of difference and yet, there is still SO MUCH STUFF. It’s like a bottomless, refilling hole. Why do I have so many socks? What’s most effective is bringing less into the house. If you don’t have it to begin with , you don’t have to figure out how to get rid of it. Take Stock and Stop Stockpiling. A simple glance in our bathroom cabinets last fall indicated we had enough body lotion to last until spring of 2018. I won’t buy any more until every bottle is used up, including those little freebies I seem to bring home from hotels. No stockpiling, even when items are on sale. Don’t replenish or replace until you are in need. Avoid the Target effect! 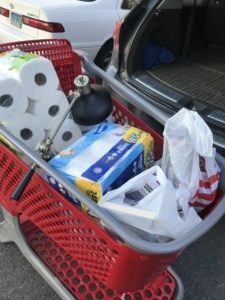 Ever go into Target (or Home Goods or similar store) for six items and come out with a $200 worth of stuff in your cart? These stores were my kryptonite. No matter how hard I tried, I couldn’t get out without some impulse purchase. 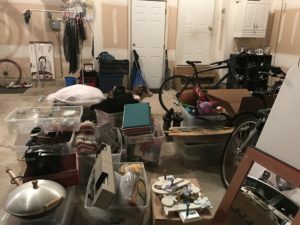 We can always use batteries, trail mix, that cute platter, cocktail napkins for a hostess gift… It was a major victory the day I went to Home Goods for two fuzzy throws for our family room couch and left with… two fuzzy throws for our family room couch. Nothing else. I felt like a Superhero. Digital Clutter is Clutter! It might not take up much space but I am adding digital clutter to my list of items to cull. I had over 9,000 emails stored in my personal email account. I’ve been religiously deleting at least 50 a day. I’m down to 5,000+ now. The process, while slow, adds up and it’s been fun to revisit (and save!) a few of those early emails that have valuable memories, like responses to my daughter’s birth announcement, while getting rid of PTO meeting reminders from 2009. Delete unnecessary emails as they come in or set up simple rules that send unwanted emails directly to a spam folder you can trash en masse. Do you need it? Do you use it? Do you love it? Does someone else need it? Would they use it? Could they love it? Sure you could also ask yourself if an item sparks joy. I’m finding joy through having less. I don’t feel like anything has been lost in what’s been rid. It feels freeing, opening up space for more of what I need and use and want and less of what I don’t. I won’t be able to fit everything I own into a backpack to travel the world, but I’ll have a lot less that I’ll love a lot more. And for right now, that’s all I need. What about you? What do you have too much of? Sometimes what you add to your life comes from what you delete. After all, if things in your life aren’t adding up the way you want them to, maybe it’s time to start subtracting. Read an update on this story in The Beauty of an Empty Bin. Valerie Gordon is a former award-winning television producer and now the founder of Commander-in-She, a career and communication strategy firm. She runs group workshops and works with individual clients, helping them to take command of their stories and craft successful and satisfying next chapters. Contact her at info@commander-in-she.com. I love this! I am going to hit you up for organization tips ! Stay tuned for follow-ups to this article… with tips from an Organizational Expert!